I’ve been to Barcelona twice and the second time I got to explore the sights more fully during the seven days I spent there (well, six, since I took one day to travel to Dalí’s museum in Figueres). I said “couples” above, in the title. Barcelona is best experienced with a congenial travel partner, whether as a romantic couple or great friends. I went with a wonderful friend of mine, and had an amazing time discussing Picasso’s paintings and Dalí’s works, fruit on display at La Boquería food market, designs at Desigual clothing stores (Desigual is actually based in Barcelona), and the occasional Spanish flick late at night at a movie theater by the Mediterranean Sea. Speaking of the Mediterranean, Barcelona is more than Gaudí’s houses and his Sagrada Família, or the other attractions I’m listing below. It is also a place with great beaches and great food. It's the city with the famous La Rambla, a street where you can see everything: street performers, many of them posing as statues, tourists of all kinds (a feast for any photographer), flowers and various kiosks, the food market La Boquería, which is a must-see sight in Barcelona, the Gran Teatre del Liceu, an opera house which looks amazing inside and out and where locals in very elegant dress flock on many a evening . . . and the list can go on. La Rambla ends with the Columbus Monument (built for the 1888 Universal Exhibition) at the sea end. It’s equipped with an elevator taking visitors to a gallery at the top which allows for a nice view over the harbor and La Rambla. The Port Vell Harbor, where the Columbus Monument is located, is also home to one of the largest and best designed Aquariums in Europe. We particularly enjoyed the underwater tunnel which features sharks of various sizes as well as many other marine species. Whether you’re planning a honeymoon or a romantic getaway for the weekend, keep in mind that the best months to visit Barcelona are May, June, and September. Now on to architecture and various arts in Barcelona! The Spanish Village in Barcelona was built in 1929 for the International Exhibition (World’s Fair) the city hosted that year. It features buildings, reproduced to scale, from all around Spain. It is, in effect, an open-air museum of architecture. It was built at the initiative of famous Catalan architect and art historian Josep Puig i Cadafalch. The Modernist Casa Amatller next to Gaudí’s Casa Battló on the famous Passeig de Gràcia is his. Poble Espanyol was designed by architects Francesc Folguera i Grassi and Ramon Reventós i Farrarons. Its construction took thirteen months. The village was never meant to last beyond the Exhibition itself, but it was so popular that the people of Barcelona decided to preserve it. The Spanish Village now offers more than just great walks. There are cafés and concert venues, and many shops selling crafts. I have bought a few necklaces here, and they are quite special. You can also watch artisans make glass sculptures. Whether you already know what you want to see in Barcelona or you’re open to discoveries (or both), one of the best ways to sample the architecture of the city is the tour bus. There are two lines: red and blue. Get a ticket for both, enjoy the tour, and hop off whenever you think you would like to see a particular attraction. We didn’t know much about Monestir de Pedralbes when we got off the bus, but we had the time and wanted to see as much of the city as we could. And, just like other lesser-known tourist sights in Barcelona, this monastery-slash-museum was such a pleasant surprise! I was in awe of the cloisters myself, by the beauty of the delicate three-story arcades forming the sides to an open rectangle of harmonious proportions. Monestir de Pedralbes is considered one of the finest examples of Catalan Gothic architecture. The monastery was founded by King Jaime II and his wife Queen Elisenda de Montcada in 1326, and inaugurated a little over a year later, in 1327, when the building was almost in its present form: a third story was added to the cloister galleries in the 15th century. From the 14th century up to 1983, when Pedralbes Monastery was open to the public as a museum, the place was home to a community of Clarissan nuns. Nuns of the Order of Saint Clare still live at Pedrables, in a modern extension. The museum at Pedralbes exhibits works of art and various liturgical objects. We missed many of them because we arrived late, close to closing time. As always when you travel, it’s a great idea to check museum opening hours as you make some sort of plan for the day. Even so, as was our case with this museum, you will discover gems along the way and arrive unprepared in some form or another. Barcelona Cathedral, located in the Barri Gòtic (Gothic Quarter) was built between the late 13th century and the 15th century, with elements, such as the Neo-Gothic facade, added in the 19th century. It’s dedicated to the Holy Cross and St. Eulàlia. The latter is one of the two patron saints of Barcelona. She was tortured in thirteen different ways during the times of Roman Emperor Diocletian for being a Christian. When she died, she was only 13. Her remains rest in a sarcophagus in a crypt of the Barcelona Cathedral since the 14th century. As some form of testament to her purity, 13 white geese are lovingly kept in the cloisters of the Cathedral. There’s something fascinating to me about church cloisters, and I couldn’t fully explain what. It does have to do a lot with the way the arcaded passageways open on one side to the courtyard, allowing for the play of shadows and light, for the sensation, as you stroll through the walkways, that you are both in a sacred place and outside, in the light of the sun. In the case of these cloisters, an important part of the whole experience are also the many red tea lights next to the chapels of the inner wall of the arcade, as well as the fact that you are prevented by fences from actually enter the courtyard, and can only look at the fountain and the pond, vegetation and geese, and the beautiful statue of St. George from a distance. A visit to the cloisters of the Barcelona Cathedral is truly special for anyone with a passion for the way built space can affect mood, create tension and emotion, and invite to reflection. Every Sunday at noon (edit: and on holidays -- see deanie's comment below) locals gather in the Plaça de la Seu in front of the Cathedral to dance the sardana. They gather their purses and jackets and whatever else encumbers them in front of a circle, join hands, and start dancing a rather slow dance in a meticulous fashion. There is also a small band, called a “cobla,” providing the music. Anyone can join in, but I advise you to first try to practice the steps on your own, or you may throw off the whole circle. I had a lot of fun trying to dance the sardana, with my friend filming my steps. It would have been even more fun for me if my friend had danced with me, but she appeared to have fun watching me. If you’re going as a couple in Barcelona, this is one experience not to miss. It’s a great way to spend not just a few minutes, but a whole hour, taking in the serenity of the people from all walks of life and all ages joining each other in dance. The sardana is the main traditional dance of the Catalans and represents their pride and their unity across social markers such as gender, age, and class. Also on Sundays in Plaça de la Seu you will find sellers of coins and stamps, and various trinkets and knickknacks. I often visit such fairs here in Bucharest, and enjoyed looking at artifacts in Barcelona because they spoke so much of Spanish history. I particularly enjoyed some old books, postcards, and religious items, as well as some sweets and perfumes. Disseny Hub Barcelona (Design Hub Barcelona) is a combination of four design museums: for the decorative arts; textiles and Spanish fashion; graphic art and typography; and ceramics. It’s currently in the process of being relocated to a new building in Plaça de les Glòries, so it’s closed for the moment (March 2013). -- platform shoes from 1500-1600, called (in English) chopines. Made of silk velvet, leather, and cork. Chopines, lifting the feet from the soil sometimes 50 cm (20 in. ), were originally designed to protect women’s shoes and long garments from street mud. The Catalan Modernisme (Art Nouveau) movement has generated in Barcelona one other great masterpiece alongside Gaudí’s creations. It’s the Palau de la Música Catalana (Palace of Catalan Music), a concert hall designed by Lluís Domenèch i Montaner and built between 1905 and 1908, that is been added to the UNESCO World Heritage List in 1997. There are guided tours in English available. You’ll see beautiful Art Nouveau sculptures and trencadís mosaics (made with pieces of broken tiles) as well as amazing stained glass, starting with the majestic skylight in the form of an inverted dome. Also, the acoustics is great (try to make it to a concert there if you can). We listened to a Bach piece that the tour leader played on the organ with the help of a remote. The collections of MNAC are housed in the Palau Nacional, located on Montjuïc (Jewish Mountain) hill. You can get there on one of the tour bus lines. The place offers a great view over Barcelona. Apparently there’s also a Magic Fountain (Font màgica) close-by, with waters raising and falling under lights that change color. There’s also music. The fountain is closed on Mondays, Tuesdays, and Wednesdays. If you don’t have much time in Barcelona and favor contemporary art over medieval art, then be sure not to miss the MACBA. It has a nice permanent exhibition and great temporary shows as well. Some of the highlights are Edward Ruscha’s Sunset strip, a film of Robert Smithson’s Spiral Jetty and his notes on the "Movie Treatment for Spiral Jetty," Internationale Situationniste magazines, and others. There were also two temporary exhibitions on show when we visited in 2010, Rodney Graham and John Baldessari. We highly enjoyed both. You can also find on Montjuïc the Joan Miró museum, which is not to be missed. Whether you’re a fan of modern art or not, you’ll find things to entertain, educate, and inspire you. Take for instance a painting with two black dots and a curved line, called “Hair pursued by two planets.” Or a partially-burned painting, where you can see the cross-shaped wooden support at its back. There’s a lot of modern art’s inventiveness at play in the works displayed. I encourage you to see this museum. It will give you and your (travel) partner many things to talk about and joke about, since modern art in the hands of Miró is at times very serious but often quite jocular and funny. The Barri Gòtic (Gothic Quarter) is wonderful for anyone interested in the architectural feel of a medieval town. You’ll also find here several important attractions, some of which I have covered in this article (Barcelona Cathedral, Palau de la Música Catalana), and some of which I haven’t (the Church of Santa Maria del Mar, which we visited and enjoyed, the Barbier-Mueller Museum of Pre-Columbian Art, which I wish we had visited, and others). Take time to stroll through the narrow streets and enjoy the squares. You’ll find busking musicians. One night we also came across a pantomime show mounted on a makeshift stage in one of the squares. The Picasso Museum is pretty amazing. You’ll find here an expressive portrait ("Hombre con boina") in bold colors, done when he was only 13, works from 1897-1900, when he was under the influence of Art Nouveau and Toulouse-Lautrec, works from his Blue Period and Rose Period, Cubist paintings, his Las Meninas Series (based on the painting by Velázquez), ceramics (I loved them), and more. Most of all, however, I enjoyed the early Picasso, his formative years. This museum has the best collection of his early works. Passeig de Gràcia is the top destination for Gaudí lovers in Barcelona, for it is here that you can find the Modernista architect’s Casa Battló and Casa Milà as well as other buildings from the turn of last century, by architects working in the Catalan version of Art Nouveau (known as Modernisme). The houses making up this "Block of Discord" – so-called because of these buildings’ very different architectural styles -- are Casa Lleó-Morera, designed by Lluís Domenèch i Montaner; Casa Mulleras, by Enric Sagnier i Villavecchia; Casa Amattler, by Josep Puig i Cadafalch; and Casa Battló, by Antoni Gaudí i Cornet. (You'll often see these names with only the first last name.) You can see part of Casa Amattler and Casa Battló in the photo above, and you can get a glimpse of all these two and others of the block of discord on Passeig de Gràcia in the small video (filmed with an old pocket camera). It's worth getting a good camera for your trip. 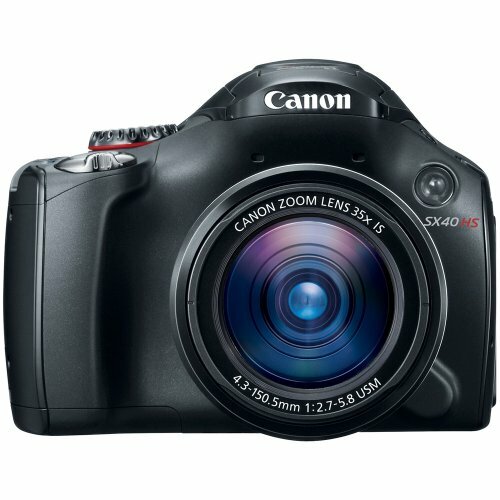 I recommend a model released in the summer of 2011, because it's great value for the money: Canon SX40 HS (see below). It's a 12.1MP camera that shoots 1920x1080 Full HD and 1280x720 HD video at 30 frames per second. It also has a 35x optical zoom! It begins at 24mm wide-angle and goes up to 840mm in 35mm film equivalent, which is a really large telephoto lens. If you want a slim compact camera, get a high-end one that can capture RAW images. 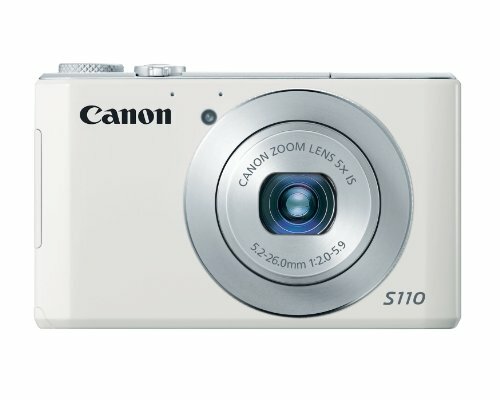 I now have a Canon PowerShot S110. This one is also 12.1 MP, and it shoots Full HD video, just like the SX40 HS. However, Canon S110 does only a 5x zoom, starting with the same wide angle of 24mm. Its range is the 35mm film equivalent of 24mm to 120mm. Both have a high ISO and all sorts of great features. I recommend them both, but if you want to travel light and think you might not need a telephoto lens, I'd say get the S110! You most likely know what they are: Park Güell, La Pedrera (Casa Milà), Casa Battló, and, of course, La Sagrada Família. With its gingerbread-like houses at the entrance, its famous mosaic dragon, its slanting colonnade "La Ola" and other structures, Park Güell seems to be lifted out of a fairy tale. It is, indeed, and enchanting space. Besides the architectural features and the vegetation, you will find here a museum dedicated to Antoni Gaudí, who built this park between 1901 and 1914 for Eusebi Güell, and anglophile and admirer of the English "garden city" movement. Casa Milà, Casa Battló, and the Sagrada Família are part of the modern Eixample (meaning “extension”) district of Barcelona, laid out in the second half of the nineteenth century following the plans of Ildefons Cerda. With its stone facade undulating like so many waves and the wrought-iron balconies (designed by Josep Maria Jujol) suggestive of algae, Casa Milà, nicknamed La Pedrera (“stone quarry” – its raw-looking facade was made of limestone from Vilafranca, a town 60 km from Barcelona) is one of the first examples of biomorphic, if not really organic, architecture. We visited there a museum which explains Gaudí’s structures: the relationships between structural work (besides masonry, Gaudí also uses a steel frame to support the building), facade and terrace in La Pedrera, the structural system of the central nave of La Sagrada Família, etc. You’ll see models and illustrations of Gaudí’s catenary arches. You should also climb up to the rooftop, where you’ll see some iconic images for Barcelona: chimneys that look like stormtroopers from Star Wars. I’m reading you can also see Gaudí memorabilia and visit one apartment while at La Pedrera, but we have missed that. There’s also a collection of modern art paintings and Renaissance drawings. La Pedrera, a corner building, folds around two interior courtyards. One of them has a staircase decorated with an ornate ironwork banister as well as with painting in pastel colors, with human and floral flowing forms (the latter on the wall to the side as well as above the staircase). Casa Milà was built between 1906 and 1910 and completely finished in 1913. It was commissioned by a wealthy couple, Pere Milà i Camps (lawyer, industrialist, and politician) and Roser Segimon (the widow of José Guardiola, who had made his fortune in Latin America). With its trencadís of colored glass and ceramic discs, the roof like the scales of a lizard, and the luminous blue tiles inside, and the oak woodwork in the interior carpentry, especially in the light well, Casa Battló is another beautiful and playful creation of Gaudí’s. This one, too, earned a nickname from the local residents, namely “Casa dels ossos” (“House of Bones”), for all the bones and skulls references on the facade (in the balconies and tibia-shaped sandstone pillars). The facade is often read in the terms of a metaphor involving St. George (patron saint of Catalunya), whose lance, topped by a cross, we see at the top, and the dragon he killed, suggested by the iridescent ceramic tiles of the roof; the skulls and bones would then be those of the dragon’s victims. To learn more about Casa Battló, you can buy a great guide at the local gift shop. There are also audio guides available. I have enjoyed both. Please, don’t be discouraged by the high-priced tickets (20.35 euros for adults / 16.30 euros for students, as of today, March 22, 2013; but you get a book of coupons when you pay for the bus tours -- I think you get a discount for Casa Battló as well). Gaudí’s Casa Battló is a redesign (1904-1906) of a building built between 1875 and 1877. Textile industrialist Josep Battló i Casanovas bought the place in 1900. His family lived on the "noble floor" of the building until the 1950s. Besides his interest in the forms of nature and stories of mythology, Gaudí was a man of deep religious faith. Towards the end of his life, after he finished Park Güell, all he was interested in was his great masterpiece, the Basílica i Temple Expiatori de la Sagrada Família (Sagrada Família, for short). Construction on the project started in 1882 under the direction of Spanish architect Francisco de Paula del Villar y Lozano, with Gaudí taking over a year later. Construction work stalled often in the decades that followed, but Gaudí could be found hard at work, surrounded by plans, studies, and sculptures right on site, in a studio he kept at La Sagrada Família. When he died in 1926, after having been run over by a streetcar, the church was still a construction site. And so it is today, 87 years later. Some expect the building to be completed by 2026, when the city will celebrate a century since the birth of “God’s Architect.” Others say it won’t be finished until 2030. When finished, the Sagrada Família will have 18 towers, grouped as follows, in ascending order of height: 12 for the apostles, 4 for the Evangelists, one for the Virgin Mary, and finally, a tower for Jesus Christ. I’m told La Sagrada Família offers great views over Barcelona. It so happened that we didn’t get to see any. We’ll have to return in 2026 (or 2030)! 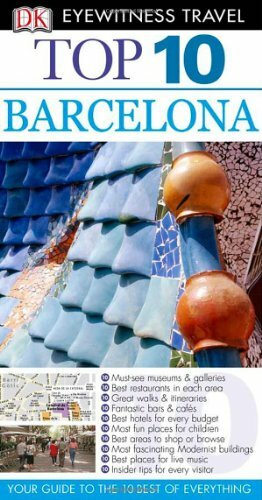 There are plenty of Barcelona guide books out there, but I think the Top 10 Barcelona in the DK Eyewitness Travel collection is by far the best English-language guide book available. It's packed full with information on places to visit in Barcelona, including parks and gardens, restaurants, cafés, bars and clubs, sights easily accessible from Barcelona (don't miss the Monestir de Montserrat), and many other types of locations, including many architectural jewels and museums I haven't listed here. The authors list galleries and design shops, vintage and second-hand shops, good-value eats, suggest itineraries, give eating & drinking tips, shopping tips, tips for travelers on a budget, etc., etc. I could easily spend another two weeks, if not a whole month in Barcelona just visiting more attractions of interest to me listed in this book. The Top 10 Barcelona guide book also comes with a wonderful plastified, small but comprehensive (remember those large unwieldy maps? This is not one of them) and extremely useful map of Barcelona, which includes a map of the metro. I'd like to see some smaller towns in Catalunya when I visit next. Mira, Very nice! Catalunya is such a haven of culture and energy, and Barcelona, as one of the last places of a Freddie Mercury concert, is such a delightful mix of innovation, modernity and tradition. 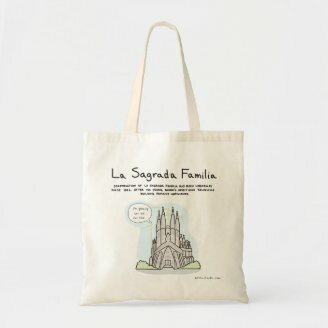 It would be so exciting for Sagrada Família to be finished in our lifetimes! 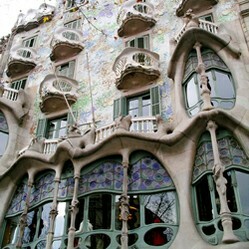 I'm so happy Gaudi made the list! Wonderful pictures by the way. I loved Barcelona, though beaches were gross. It's definitely a city for art appreciation. Thank you for bringing my attention to this article, and for tweeting it. I have added a few colorful and fun Zazzle products, to break up and enhance the long text. Yes, Barcelona is a beauty! It can be a little cold at this time of year, but there's beauty everywhere. The inside of houses is amazing, too. Just step into some Art Nouveau ones. MNAC in Barcelona is wonderful, isn't it? I might ask you for photos when I write a separate article about it! Thanks for letting me know about the dancing. I'll revise the article right now. Wonderful article. Barcelona is such a gorgeous city. FYI, they also dance in front of the cathedral on holidays (we were there for the Feast of St. John). An enjoyable way to spend time with a friend is to walk through a park as you talk and take photos. Here's Herastrau Park in Bucharest, with photos and a short video.